Thirty-six years after Mel Gibson first donned a policeman’s uniform in the original “Mad Max,” the titular hero returns, this time played by Tom Hardy. 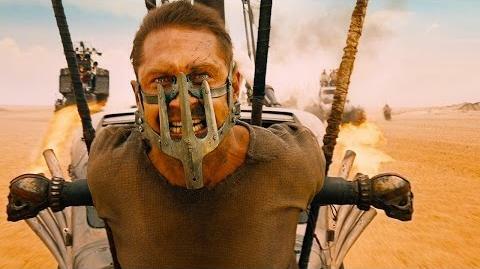 “Mad Max: Fury Road” picks up with Max once again wandering the desert trying to steer clear from packs of marauders and psychopaths. After unsuccessfully fleeing the followers of Immortan Joe (Hugh Keays-Byrne, who played Toecutter in the original Mel Gibson film), Max finds himself prisoner in a cult-like society where Joe controls the water supply and demands the worship of his people. At the same time, Imperator Furiousa (Charlize Theron) is trying to smuggle Immortan Joe’s captive brides out of the territory and return to her homeland: a “green place” that promises a better life than the barren desert where they currently reside. Through a series of events, Max teams up with Furiosa and the brides (future band name?) and aids in their attempt to flee Immortan Joe, who has an army of suicidal followers in pursuit of them. Writer/director George Miller returns to the material that first gave him a career, but this project has actually been in the works since around the time “Mad Max Beyond Thunderdome” wrapped up in 1985. Much of Fury Road’s main storyline has allegedly stayed intact over the years, but a series of rewrites, casting changes, and other production drama has kept the project on a shelf for a long time. Miller’s input is vital to the film because he has a vision like very few people in Hollywood have today. Just watch the trailer and try to think of another filmmaker doing anything remotely similar these days. As a director and world builder, Miller is nearly irreplaceable. After the first 20 minutes or so set up the film, the rest is an adrenaline-filled car chase for nearly its entire length. That may sound exhausting, but the script breaks up the action just enough to let you breathe. Though there isn’t much in the way of traditional character development, the performances by Theron and Hardy provide enough backstory simply by their small mannerisms. Around the time the film was released, there were several articles floating around discussing how this was a feminist film (negative connotation) and how Mad Max wasn’t even the hero, etc. This is the furthest thing from the truth. While the film does feature strong female characters and most of the men aside from Max and Nux (Nicholas Hoult) are evil, there’s no secret agenda at play. If the worst thing about “Mad Max: Fury Road” is that both males and females get good roles and fun action sequences, that’s actually high praise. “Mad Max: Fury Road” is the best action film since “John Wick” and makes the CGI sequences of films like “Avengers: Age of Ultron” and “Fast and Furious 7” look like child’s play. Practical effects with the right execution will beat computers 9 times out of 10 and this film is a perfect example. Though its simple story and characters may leave some viewers wanting a little more, “Fury Road” delivers in every way that it should and is easily one of the year’s best films so far. Now that we’ve come back around to another outing with the Avengers, the question is: Can the sequel live up to its predecessor’s expectations? The short answer is “no,” but that’s not such a bad thing. “Age of Ultron” picks up with the full team rushing to defeat Baron von Strucker (Thomas Kretschmann), a leader of Hydra, who possesses Loki’s scepter from the previous film. Though the villain is foiled rather easily, his work lives on in superhuman twins Pietro (Aaron Taylor-Johnson) and Wanda (Elizabeth Olsen) Maximoff. When Tony Stark (Robert Downey Jr.) discovers that the scepter holds the key to artificial intelligence, he decides to create Ultron (James Spader), an AI system that can theoretically police the world through an army of robots. If you’ve seen any science fiction movie ever you probably know where this is headed. 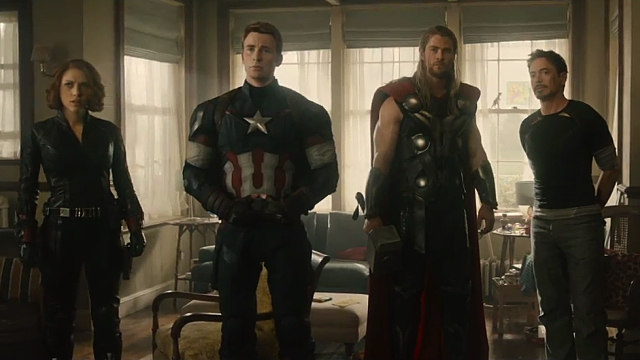 In the first Avengers film Joss Whedon spent a large portion of its running time bringing the team together as a unit. Like an NBA franchise that brings in several megastars on one team, there has to be time for ego to give way to camaraderie. With that issue mostly settled, the new film gives the audience a look at a more mature squad of heroes. More choreographed team maneuvers cannot hide, however, the divisions that will be coming soon in Captain America 3 when civil war strikes. There is no mistaking that “Age of Ultron” tries to make up for the flaws of its predecessor as well as a recent DC film. The former is that the film spends a lot of time developing and shining a spotlight on Jeremy Renner’s Hawkeye. Under mind control for most of the first film, here the archer gets to make more quips and interacts frequently with Pietro aka Quicksilver. As for that DC film, one of the main gripes Zack Snyder’s “Man of Steel” received was that it didn’t firmly establish Superman’s concern for civilians and their safety. Fast forward to “Age of Ultron” and we are spending half of the finale watching Avengers put people on lifeboats to avoid Ultron’s deadly plan. It doesn’t detract from the action enough to be a major complaint, but no one really bought a ticket to watch the Red Cross go to work either. While the film delivers more than enough explosions and laughs to warrant the ticket price, the sequel does have a “been there, done that” feel to it. Perhaps I’m the only one, but 11 Marvel films is a lot. Part of the reason why “The Winter Soldier” and “Guardians of the Galaxy” were able to breathe life into the Marvel universe is because they felt different and each had its own personality. “Age of Ultron”, on the other hand, feels more like a generic superhero movie. Very fun and entertaining, but generic nonetheless. Originally the film was set to be roughly a half hour longer, but Whedon and Co. were forced to leave a lot of footage on the cutting room floor. This leaves the film with a bit of an uneven pace as well as a few small questions in the plot. It also makes Thor a substantially less interesting character by reportedly cutting out most of his subplot setting up 2017’s Thor 3. But enough with the negative, let’s talk some positives. Though I think the character could have been handled better, James Spader was perfect casting for Ultron. Voice acting isn’t as easy as some people make it out to be and he nailed it. “Age of Ultron” was finally able to make the team feel like something more than Tony Stark and friends. For good reason, Robert Downey Jr. has been the face of the franchise until now, but here he is a member of a team rather than the most important guy in the room. “Avengers: Age of Ultron” is an imperfect, but entertaining action film that sometimes suffers from being too generic and following a long line of other Marvel films. Since the internet is all about lists these days, I would probably rank “Age of Ultron” 4th out of all of the Marvel films to date, just between “Guardians of the Galaxy” and “Iron Man”. Feel free to share your thoughts below.